For those of you who don’t know, my house is named “The Station.” It’s a duplex with an upstairs and a downstairs apartment. For almost ten years, the upstairs apartment has been occupied by various women from the University of St. Thomas Catholic Studies program. The downstairs apartment had had a variety of occupants, until I moved in with four Catholic men. But unlike what is proposed as “The Benedict Option,” the community wasn’t really “intentional.” Though all committed Catholics, we had a strange mix of personalities, including a vivacious hostess, the classiest of fifth grade teachers, a temperamental but very lovable lorax, an obnoxious (but also lovable) dance instructor, and an ideas-obsessed gay grad student who alternated between angsty party boy and pious poet. We were very close, but we all had our own “thing,” our own friends, and different social priorities and interests. The first year was hard at times. There were some fights, some bickering, discussions about boundaries, and questions about whether the guys would stay. But we stayed, and this August I’m planning to sign the lease for year four. We worked things out. Now, we fight more openly, we talk about each other more frequently, and the boundaries are unspoken but mostly understood and charitably flexible. It’s become much less friends living together and more family. We’re not perfect, and we don’t always get along. But we really do love each other. These are the kinds of people who take off work to be with you when you’re depressed and who happily help you wash your mounds of dirty dishes. They want you to say hi when you return from vacation, and birthdays are a priority. To be sure, there’s real sacrifice involved. People see us and don’t realize how hard it was to get where we are. It involved real work, and I think the reason why more people don’t live in strong communities is because they don’t want to put in that work. You give up a lot of independence and privacy in community, which involves endless sacrifice. And you have to commit. You commit to others’ quirks and foibles and flaws, and they commit to yours. You commit to changing your way of life to make room for another. You commit to daily inconveniences and managing your expectations. You commit to living each other’s moments of selfishness. But it’s not a bad commitment. It’s a commitment to being a person, to being in relationship. And many of those quirks and foibles and flaws are things you may grow to love in each other. And you also commit to living each other’s moments of love, which can be astoundingly beautiful in the subtle grace only a friend can recognize. Our house definitely has a charism, but it’s hard to say what it is. I think one of our strengths is that our community isn’t so “intentional” as it is responsive, growing out of the people it comes into contact with, rather than setting out a code of expectations. We regularly invite guests to brunch after Sunday mass because one of us likes hosting brunch. One has a gift for aesthetic lighting, an invaluable skill for any evening. Another is the Sam Gamgee to the Frodos of the house: the quiet sideline support who frequently ends up being the hero. Another organizes wine tastings. Two of us host (separate) book clubs. I host a writing workshop and evening discussions over wine. If our house had “four pillars,” one would be wine. Maybe that’s our charism. Our biggest events are our parties. 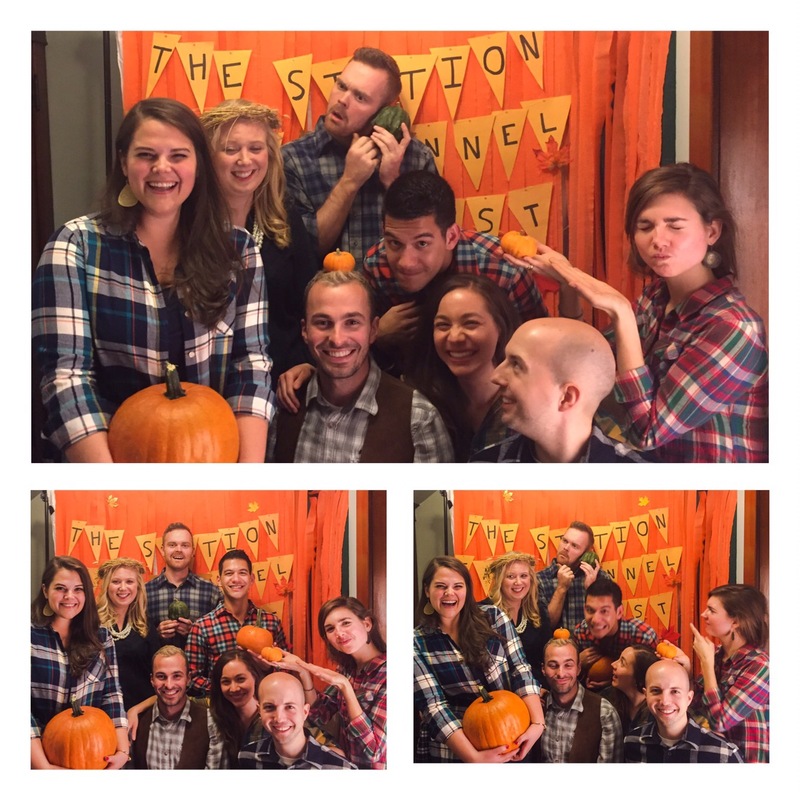 The “Fall Flannel Fest” came out of the creative interests of our individual personalities. It wasn’t a party any of us would have thrown on our own, but was the dynamic integration of persons, each with unique interests. I wanted to make a photo booth. Another had all the food ideas. Another thought we should have the men bring booze and the women bring pumpkins (brilliant – I think next time we should have men bring booze and women bring cleaning supplies… or toiletries). Another decided to have prizes for winning, by popular vote, “hay king” or “pumpkin princess.” Honorable mention awards included “Paul Bunyan Hearty Flannel Award” and “Saint John Paul the Great Hipster Flannel Award.” It was all very silly and very fun, and we had dozens of guests who stayed far too late. I’m not sure I want an “intentional community.” It sounds too forced, too formulaic. My house is cohesive because we’re committed to a communal way of life, because we’ve decided to stay where we are after graduation, because we love the Church, and because we want each other to be ourselves, our unique and unrepeatable, strange and lovable selves. The house changes every time someone moves out or moves in, and it should. It also changes as we make new friends and meet new people in the community. The charism is more responsive than “intentional.” I don’t want to love “the house” more than I love these people. In a world very devoid of community, hospitality, and loving Christ-centered relationships, my house has been a huge source of joy for me and for others. We’re providing what we haven’t been able to find in many other places. But we’re not trying to combat a culture or to “save Christianity” or, really, to do anything in particular. We just want to cultivate our gifts and talents and to love and serve each other and our community. It’s not an “option.” We’re not trying to make something new or preserve something old or do something different. We’re just living life, and trying to be our fullest selves. It’s far from perfect. But if we’re going to live here and now, we might as well do it together. And we might as well make a party of it. You should, too. But don’t throw our party. Throw your party. The world needs both. Excellent! I enjoyed reading that. But… what do you mean by saying you don’t want to be an intentional community? If, as you say, you are “committed to a communal way of life”, that sounds like you’re intending to live communally, so an intentional community. I guess what you’re (rightly) kicking against is a rigid a rule of life and lifelong commitment.